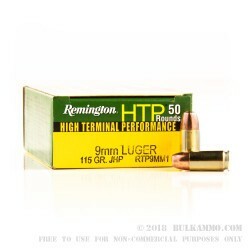 Remington HTP hollow point rounds combine strong penetration with reliable expansion. This 9mm Luger load uses a light 115 grain jacketed hollow point and achieves a muzzle velocity of 1145 feet per second. 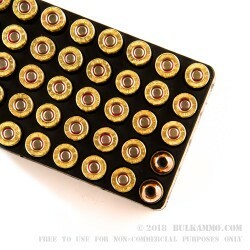 Each box contains 50 rounds, making it easier to test this ammo in your firearm before carrying it. 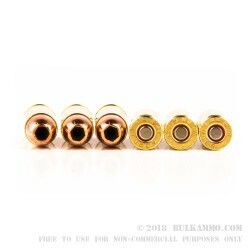 The cartridges use new, reloadable brass. This standard pressure load will work well in any 9mm Parabellum firearm, and is especially suitable for “pocket nines” such as the Kahr CW9/PM9, Sig P938, and Springfield XDs-9. Remington has a long history of building firearms and ammo for American citizens, law enforcement officers, and military personnel. In addition to its famous line of shotguns and hunting rifles, the company has built M4A1 carbines for the US Army and Remington 700 rifles for numerous police agencies. Recent introductions include the Remington R1 1911 pistol, Versa Max semiautomatic shotgun and the Model 783 bolt-action rifle. This is some of the most reliable ammunition that you can buy. It has some of the best expansion and penetration for its grain size. I would trust my life on it in a heart beat. I have ran about 300+ rounds through ole ladys' Ruger SR9C and a P30L H&K (which shouldnt count since it could probably shoot bubble gum).